Premier Roof Systems is a North East based installer, manufacturer and supplier of high performance fenestration industry systems that improve people’s’ living experiences. 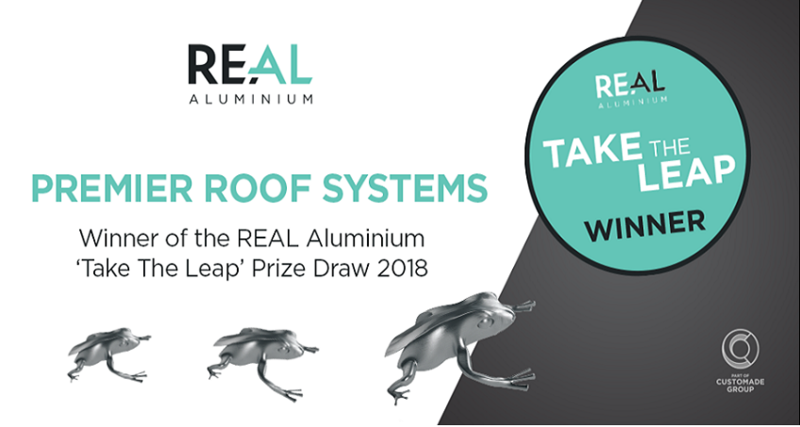 The conservatory roofing specialist was picked at random from numerous campaign entrants to win REAL Aluminium products worth £3,000. The unexpected win is bound to be beneficial to Premier Roof Systems as it offers extra and quality resources for expanding its showroom. It is also an opportunity for the REAL Aluminium sales team to showcase their wide range of products. The good news was delivered by REAL Aluminium sales manager Marie Williams who also presented the winning certificate to Chris Mullen, the Premier Roof Systems director. Chris noted that the company did not expect to win and they are thrilled to win REAL Aluminium products worth £3,000. He further stated that the products would help the company develop its aluminium department. REAL Aluminium conducts creative marketing campaigns and the ‘Take the Leap’ campaign was designed to assist installers who require support in growing their aluminium business segments as well as to help experienced UPVC installers to venture in the profitable aluminium market. These are descriptions that befit Premier Roof System and signify that it will have a competitive market advantage. Premier Roof Systems has built an all-rounded roofing business that offers products like solid conservatory roofs, aluminium and uPVC roof lanterns. The business works with a network of professionals who not only focus on completing all roofing projects effectively but also offering high quality and reliable roofing services. Premier Roof Systems has experienced a myriad of improvements since its inception in 2011. The constant improvements have enabled the industry trendsetter to attract and retain a large, satisfied client base in an attempt to develop a strong and reputable roofing brand that is well-recognized and trusted by the general public. The company is dedicated towards completing all projects within the set timelines and with integrity. Moreover, all the products are manufactured and assembled with quality materials and utmost professionalism. These are factors that have positioned Premier Roof Systems as a trusted conservatory roof manufacturer and supplier in Tyne and Wear. As such, the £3,000 worth of Aluminium products win will go a long way in boosting product variety and quality in the Tyne and Wear showroom. Premier Roof Systems is a competent, reliable and friendly fenestration industry manufacturer and supplier that endeavours to offer nothing but the best customer service and experience. It delivers long-term roofing solutions, guaranteed results and professional services to all their clients.